Based on numbers from the FBI’s annual crime report, there were an estimated 2.1 million burglaries in the United States in 2012. What’s more, nearly 75% of those crimes took place at residential properties. And, while those statistics reflect a slight drop in burglary rates, the numbers are still a wake-up call for every safety-conscious renter and homeowner in the country. Surprisingly, most burglaries aren’t random. Rather, thieves use an active and careful selection process to target homes with specific vulnerabilities. Since the best defense is a good offense, now is the time to do a security check of your own home and look for weaknesses that might make it attractive in all the wrong ways. 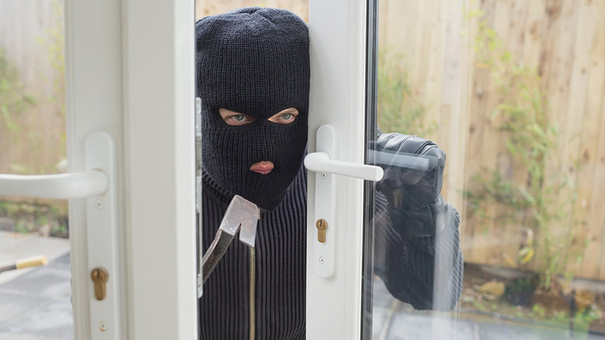 And as you do, keep in mind these 10 DIY ways to protect your home from burglary. As a rule, all exterior doors should be solid wood or metal-clad with a wood core. Anything less doesn’t offer protection against break-ins. Burglars can easily kick in hollow-core or thinner wood-panel doors, completely compromising your home’s security. Refer to the The Family Handyman’s step-by-step guide on replacing an exterior door for details on installing a more secure exterior door. A quality door deserves a quality lock, and that starts with a deadbolt. Deadbolts are more difficult to tamper with and offer an essential first line of defense against intruders gaining access to your home. According to home security tips from The Blog by Allstate, homeowners should install a deadbolt to each exterior door and make sure that the bolt portion of the lock has at least a one inch reach inside the door frame. Doorways framed by narrow and tall windows are an attractive design feature in many contemporary homes, but they’re not great for home defense. Glass near entryways can be broken and provide easy access to locks and other security devices. Security professionals suggest bulking up these types of windows by adding quarter-inch clear Plexiglas panels attached securely to the wall or solid window frame. A safety note here: Reserve the Plexiglass shields for windows around doorways or other non-essential decorative windows. Installing them throughout your home can interfere with exit points if there’s a fire. Take away burglars’ biggest advantage — the cover of darkness. Motion-sensitive exterior lighting is activated by even the slightest movement, serving to surprise intruders and provide a visual alarm to the rest of the neighborhood. Make your home less appealing to burglars by keeping vegetation trimmed. Trees, shrubbery, and tall grasses close to your home provide the perfect camouflage for intruders — offering ideal places to hide and cover the traces of a break-in. Pruning shrubs is a free offensive move and the results are immediate. Reserve a few hours next weekend to strategically cut back overgrown hedges, trees, and other greenery. Burglars often shop their targets before break-ins, peeking in windows to gauge the value of what’s inside. Shutting blinds and drawing drapes, especially when no one’s home, can help keep the contents of your home away from prying eyes. One of the burglary prevention tips from Houselogic.com urges homeowners to be more aware of the trash they set at the curbside. Burglars are busy on trash day, scouting for boxes and other packaging that may signal expensive new purchases. Don’t advertise that new 50″ flat screen TV you bought by displaying the box curbside. Instead, break packages down, seal in garbage bags, and mix with other refuse. Again, home security advice from The Blog by Allstate stresses the importance of making your home look occupied at all times. Typically, burglars want to avoid a face-to-face confrontation, instead targeting homes where there’s an obvious vacancy. Connect timers to interior lights, TVs, and radios. Set lights to come on about hour before sunset and have TVs and radios activate periodically throughout the day. Just as boxes from big ticket items advertise what’s inside your home, mail and newspapers piling up advertise that you’re out of town. Keep your comings and goings low-profile by holding your mail and stopping and newspaper delivery while you’re out of town. If you have a sudden trip and don’t have time to prepare, ask a trusted neighbor to collect these deliveries for you and hold them until you return. There’s safety in numbers. Work to build a sense of community between your neighbors. Without being intrusive, get to know names, recognize faces, identify cars, and become familiar with general schedules, etc. Understanding the pattern and flow of your neighborhood can help everyone notice the anomalies that sometimes indicate trouble. Home defense doesn’t have to cost a fortune. There are some simple and valuable measures every homeowner can take to make their spaces more secure. With a critical eye, some basic planning, and a few weekend projects, you can make your home safer and build a bit more peace-of-mind in the process.